Co-founded in 1992 by pianist Marilyn Thompson and cellist Jill Rachuy Brindel, NAVARRO TRIO celebrates its 25th season as chamber music artists in residence at Sonoma State. Comprised of violinist Victor Romasevich, cellist Jill Rachuy Brindel and pianist Marilyn Thompson, NAVARRO TRIO has performed virtually the entire “standard” piano trio repertoire. They are advocates of out-of-print and rarely performed works by composers including Rebecca Clarke, Paul Juon, Fanny Mendelssohn-Hensel, Clara Schumann and Sergei Taneyev. In the contemporary vein, they have performed trios by Chick Corea, Richard Danielpour, Brian S. Wilson, Kirke Mechem and Paul Schoenfeld. 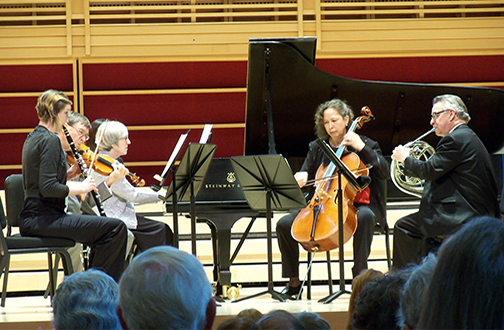 Their frequent collaborations with Bay Area musicians and instrumentalists from the San Francisco Symphony, Opera, and Ballet orchestras have brought a remarkable range of mixed ensemble repertoire that includes the String Quartets of Bernard Brindel and Iosif Andriasov; Piano Quintets of Schumann and Shostakovich; the Vaughan Williams Quintet in D; Piano Quartets of Catoire, Fauré, Mozart, Saint Saëns and Schumann, and the Horn Trios of Brahms and Brian S. Wilson. !Que Vivan Las Mujeres! Mariachi Reyna de Los Angeles® brings the spirit of the Holidays through the historic art of mariachi to the Green Music Center. Rossini’s pastoral Overture to Guillaume Tell creates a vivid portrayal of the Alpine landscape, overflowing with luscious and memorable melodies. San Francisco-based American Bach Soloists are leading performers in the field of Baroque music, dedicated to historically informed performances of Bach and his contemporaries.